These 3 deaf and almost blind pups were left to perish next to a road in a box. Fortunately they were found just in time and brought into the rescue. They were clearly under nourished and no consideration for their needs had been given by their callous breeder before they were dumped. Now currently on foster they are getting over their traumatic start to life and learning to be puppies again. Nahla, who was only rescued herself a few months ago, decided she was just what these pups needed and set about guiding, educating and rehabilitating the youngsters. Our new NCAR adopted dog Coco gets a welcome to the family by our other NCAR adopted dog Mizzie. Coco hasn't seen much of life and was very unhealthy when we brought her home. 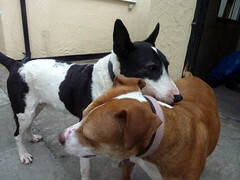 Mizzie recognised Coco needed help and set about trying to get Coco to play and start to enjoy being a dog! Her efforts are a testament to the breed! As requested (by many), here is a slowed down version of my body language video. Now the gestures can be seen as they are explained. But also, now the clip has been slowed other gestures not highlighted can also be seen! 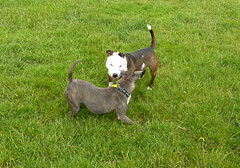 More socialising the Staffies up at the rescue centre. 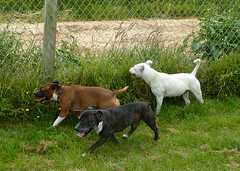 socialising some of the rescue's Staffordshire Bull Terriers offlead in the paddock. Alphie and Mizzie play fighting. Play fighting looks and sounds very much like the real thing, there are subtle differences though. 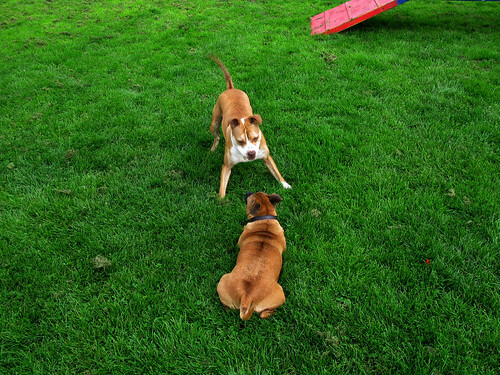 These play fight pauses demonstrated by Alphie and Mizzie keep the intensity of the play down to a level both dogs are comfortable with.